A unique video experience for all home-cinema devotees: this aptly sums up the latest creation by Adeo Screen. Would you like to immerse yourself completely in your favourite film? 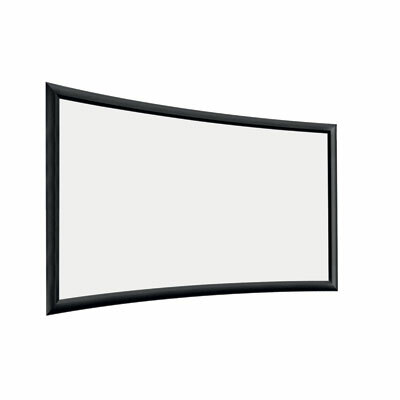 Try the new Plano Curved screen, and recreate that authentic theatre atmosphere: let each video projection surround you with images and become a totally involving emotional and sensory experience. Plano Curved artfully blends expertise and innovation, incorporating the distinctive features of the Plano model while introducing a characteristic curved profile. In addition to the product’s outstanding perfomance, there are fundamental technical aspects that we feel should be highlighted: the profile’s curvature and the optimal projection radius (based on the screen’s dimensions) significantly improve the image’s luminance uniformity. This solution can also be adopted with high-gain projection surfaces (such as HeliosWhite and HeliosGrey) with a native 2.35:1 format, eliminating any loss of luminosity at the edges that would normally occur when using a non-curved panoramic screen. The profile’s special black-velvet finish completely absorbs the light, enhancing the perception of contrast in the projected images. Available in 16:9 and 2.35:1 formats.